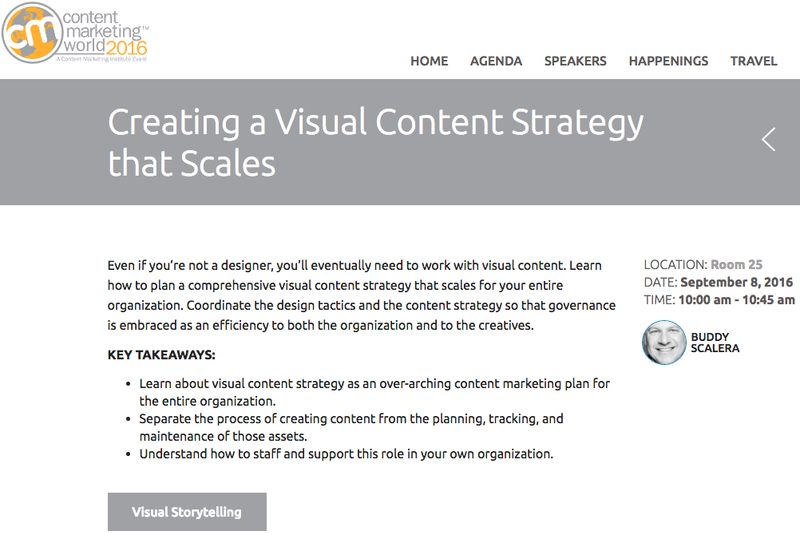 Like most of my presentations, I’ll touch on storytelling, user journeys, and visual content strategy. If you saw me as a presenter at the Intelligent Content Conference 2016 event, I’ll be covering the content strategy “wheel” again. I never published that deck, so this will be a good opportunity to see it presented live. 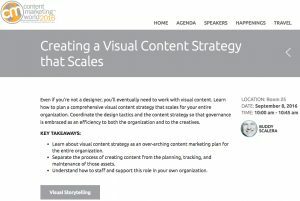 See me present visual content strategy at CMWorld 2016. I’m super excited for this event. I’ve presented at every CMWorld in Cleveland since the Content Marketing World Health Summit in 2012. This is a pretty big year with some mind-blowingly cool guests and speakers (Mark Hamill!). That said, there’s so much great activity there, I really need you to come to my event and support me. I’ll be using on of my very sparkly PowerPoint decks developed by my good friend Ivan Ruiz, a talented design strategist. The event hashtag will be #CMWorld. Use it with gusto. Like all presenters, I am terrified of a completely empty room because nobody comes to see you speak. Please come support me. Someone was asking me about my books. My new book shipped in late May of 2016. You can find out more Comic Artist’s Essential Photo Reference: People & Poses book at my ComicBookSchool.com. website. Here are a few good links to check out, if you’ve never seen me before or want to check out old presentations. This entry was posted in Conferences, content strategy, Marketing, visual content marketing, visual content strategy and tagged Cleveland, CMWorld, content marketing world, content strategy, visual content strategy by Buddy_Scalera. Bookmark the permalink.